Is the country you live in drowning in debts? Are you sick of paying too high taxes while international corporations and the richest people make use of loopholes and tax havens to avoid their fair share of taxation? Do you want an alternative to governments who keep telling you “sorry, we don’t have enough money for what citizens want”? How does it come that even the richest nations drown in debts? It’s because governments tax the wrong things. It’s useless to tax profits when the largest potential tax payers shift profits to global tax havens and other loopholes. The taxation of earned income is demotivating for working people, reduces the purchasing power, increases the cost of labor and obtains relatively small amounts of money. The taxation of wealth has to be quite high to solve the debt problem, and wealthy people can easily move their money to other countries. Nevertheless a serious wealth taxation is extremely important for other reasons (more), but not for funding budgets. There is only one source for taxes, where the amounts of money are enormously high and annually stable as well: Sales revenues. That’s quite a lot, don’t you think? What do nations get back in return today? Corporations take as much as they can while giving back as little as possible to maximize their profits. Today the typical business model of profit-driven corporations is that of a parasite. That’s not fair. And by bringing national budgets out of balance and by dividing society in very few extremely rich and too many poor this system will inevitably crash. In terms of national budgets and debt crises the crash is also just a matter of how and when. 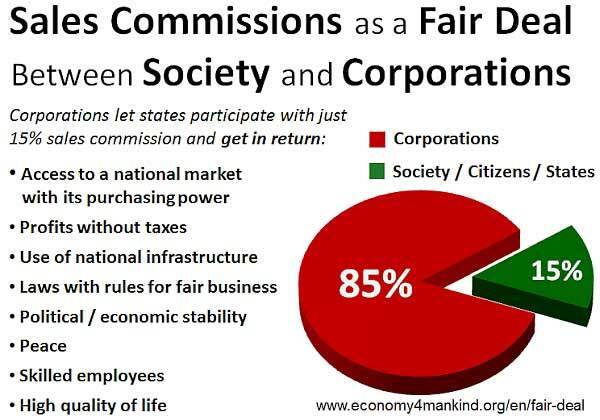 We can avoid this crash by simply letting states and societies participate in corporation’s business in a fair proportion. Just regard corporations as exhibitors on a trade show and nations as the trade show organizers. Corporations pay fees to do business, and as long as the fee of the organizer is neither too high nor too low, business can run well and everybody wins. We consider 15% sales commissions as a fair proportion. In return corporations and people wouldn’t have to pay any other taxes. If the MBS was included, corporations could make much better business than ever before. Does any intelligent person think 15% is too much for that deal? We don’t think so. Sales Commissions are extremely simple to collect and an enormous reduction of bureaucracy. We can eliminate today’s gigantic tax jungles completely, just keeping a simple version of today’s “value added tax declaration”. Corporations just give 1 declaration per month to authorities about the payments they received the month before, and transfer 15% of this amount to the authorities account. The rate of 15% is an example that is more than enough in every country. If the “Market Balance System” (MBS, link is coming soon) is included, sales will increase to an amount where sales commissions below 10% are more than sufficient. The sales commissions system leaves governments the scope to vary the rate by branches, taking e.g. 15% from industries and trade, but 0% as exceptions for food, renewable energy products, public transportation, education, culture, social services, medical services etc. All you need to realize it is just 1 law instead of today’s complete tax legislation. Click here (coming soon) to see our suggestion of how such a law could look like. If a government just has the political will, it’s a matter of less than 3 months to realize it. Let’s take a look at the 2 economic giants that both drown in debts, too: The USA and Germany. In the United States the “gross domestic product” (GDP) was 13.974 trillion US$ in 2009. Sales revenues in the USA (latest available official statistics “Table 27” by the IRS) were 24.848 trillion US$ (24.848.000.000.000$) in 2009. 15% of these domestic corporation’s sales make 3.727 trillion US$. Sales commissions are also applied on imports. 15% of 2.734 trillion US$ imports make additional 410 billion US$. 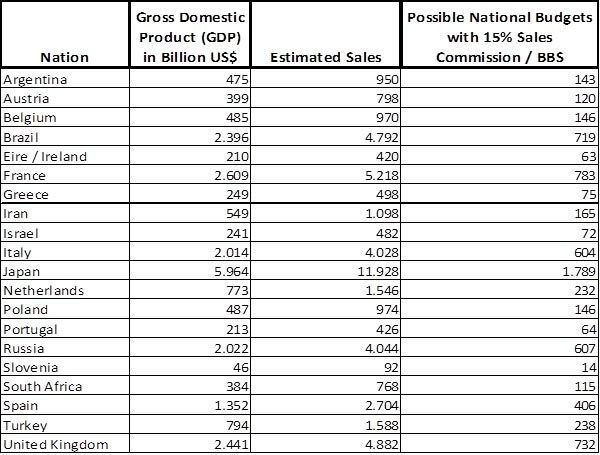 So the total sales commissions would be 4.137 trillion US$, which is about 600 billion US$ higher than the US national budget spendings 2012. Debts wouldn’t be necessary anymore. But even a lot more is possible. Including the “Market Balance System” with its increase of purchasing power, corporations could realize far higher sales, which would increase the receipts of the national budget to about 14 trillion US$ – without any taxes! Please note that today the real deficits of all nations are much higher than in the official government statistics. In Germany the situation is the same. The official debt of approx. 2.2 Trillion € is just the part of the truth that the governments admits. 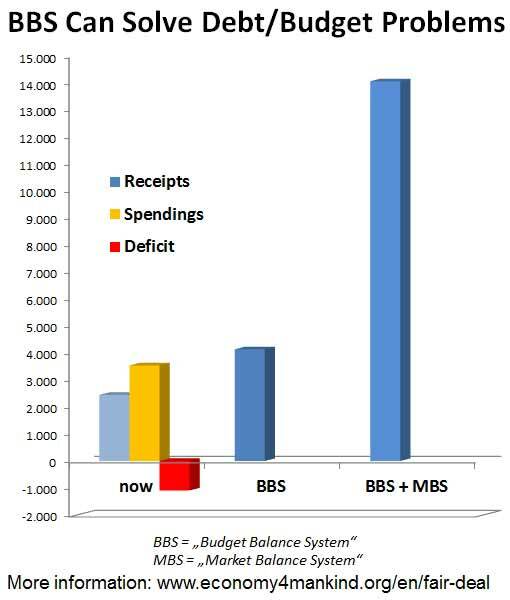 Although the government claims to manage budgets without debts, it’s just an accounting fraud. neglects investments and maintenance of the infrastructure. Sales revenues are roughly twice as high as the gross domestic product (GDP) of a nation. Take a look at what is possible. Just compare the right column with the spendings of your nation’s national budget. This will give you an idea of what is possible with the BBS. If the MBS with all its increase of purchasing power is installed as well, this is what it might look like in your country. We would be grateful of you could send us precise numbers that you researched at your national bureau of statistics. We will publish them here.